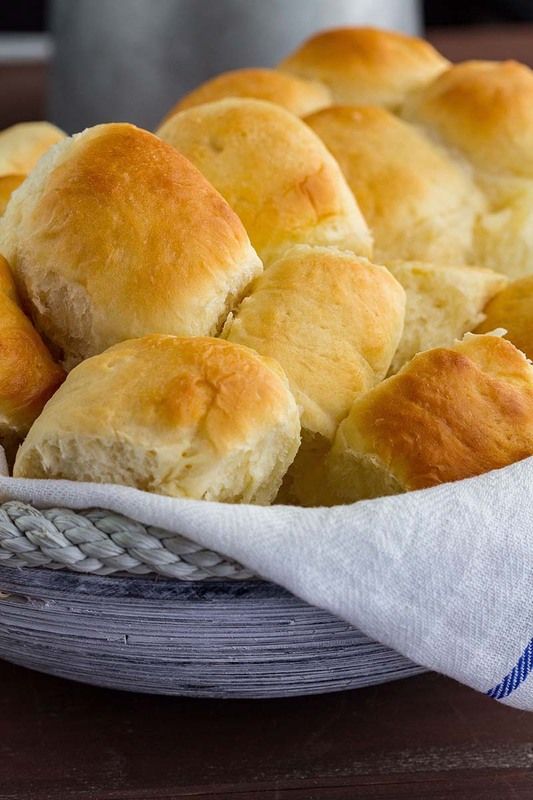 Soft yeast rolls recipe for warm fluffy buns. Made with instant mashed potato flakes, best served with any dinner comfort food. Place dough in a greased bowl, cover and let rise until doubled, about 60-90 minutes. Punch down dough and turn out onto a clean surface. Cut dough into 16-20 equal pieces. Using the heel of your hand, quickly and firmly roll each piece around in circles until it forms a tight little ball. Arrange rolls in a greased 9 x 13-inch pan. Cover with greased plastic wrap. Let rise for about 1-1½ hours. They will have doubled in size and be puffy. Meanwhile, preheat oven to 350°F. After the rolls have risen, uncover and place in oven and bake for 20-25 minutes, until golden brown. Adapted from an old Amish cookbook. Can I put the ingredients in a bread machine to make the dough or does it have be done this way? The bread machine can be used – just put it on the dough cycle. Remove dough after rising, then follow the recipe for shaping, rising and baking. I would recommend par-baking the rolls before freezing them instead of freezing the dough. You can find our tips for par-baking rolls(and freezing dough) here: https://redstaryeast.com/yeast-baking-lessons/postpone-baking/.